Stay on step ahead of Mother Nature with the Solar Powered Casio ProTrek PRW-3000-4BER, incorporating Casio's new Triple Sensor Version 3 engine. Advanced Casio original technology has allowed for a 95% smaller direction sensor and 90% reduction in sensor power consumption compared to previous models. 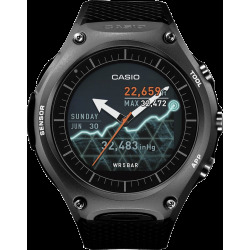 Introducing Triple Sensor Version 3, advanced CASIO original technology that makes it possible to pack sensor that are 95% smaller than those of previous models into a totally new type of compact PRO TREK. Despite their smaller size, the new sensors in these models deliver higher reading accuracy and improved energy efficiency. 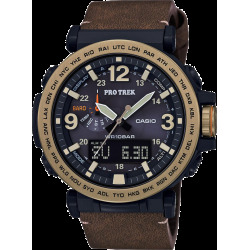 These Triple Sensor models deliver altitude, barometric pressure, and direction readings that are more accurate than previous models. 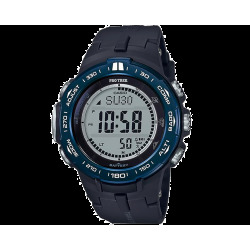 A Barometric Pressure Tendency Alarm alerts the wearer to sudden changes in pressure readings. Design features include a compact case and soft urethane for a better fit to the wrist. Large side buttons and one-press access to digital compass, barometric pressure and altitude, and temperature readings keep important information at your fingertips. 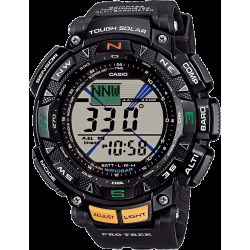 Other features include MULTIBAND 6, Tough Solar, 100-meter water resistance, and more. Everything about these models is designed and engineered to make them essential pieces of outdoor gear. 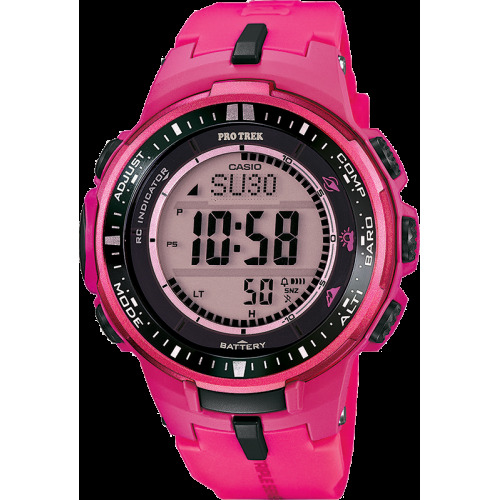 Casio ProTrek PRW-3000-4BER is guaranteed 24 months against any manufacturing defects noticed by the manufacturer, as from the date of purchase (the date of the invoice). All the details of wear are excluded from the guarantee. The guarantee is made void in case of repairs and of interventions made by technical services not authorized by the manufacturer, as well as by the inadequate use (or the use of accessories not resulting from the manufacturer) of the instrument.